• A married couple who met in the sixth grade celebrates their 70th anniversary with friends and family during Valentine's Day week. Buddy Carl Fowler (left) and Janie Agnes Cordle met when they were in sixth grade, got married before they were both 20, and as of Tuesday, have been married for 70 years. Buddy and Agnes Fowler (bottom row) pose with siblings and siblings-in-law at their 70th anniversary celebration on Tuesday (back row, from left): Bill Thorton, Avis Thorton, Gary Cordle, Carolyn Cordle, Brenda Park, Yandell Park, Margie Cordle and Sylvia Cordle. On Tuesday, two Morning Pointe residents were thrown a party to celebrate their 70th anniversary. Their children, siblings and relatives attended, bringing gifts for the couple and enjoying refreshments provided by family. "We didn't realize it would last this long," Buddy Fowler, 89, said of his marriage to Agnes Fowler, 88. "But the first time I saw her I said I'm going to marry her." "You never told me that," Agnes said with a smile when Buddy confessed to falling in love at first sight. Buddy and Agnes met in the sixth grade at Subligna School when they were both pre-teens. The two dated while Buddy was serving in the Air Force and on a weekend leave he came home with plans to get married to Agnes, who agreed. The young couple went to the home of their preacher on Feb. 12, 1949 and paid him $5 to wed them. Buddy was 19 and Agnes was 18 when they got married. "I just knew I wanted to marry him, that's what I wanted," Agnes said when she was asked how she was sure of her decision to commit to Buddy. And the reason Buddy and Agnes both commented that they weren't expecting their marriage to last this long had nothing to do with their faith or loyalty to each other but rather with the average life span for people in 1949. Buddy said when they were married, the average person died around 60 years of age. Yet, since reciting their vows, they've lived long enough to claim a 70th anniversary and to see their six-person family expand to include seven grandchildren and nine great grandchildren. The Fowlers have lived all over the world, including years raising their children in Belgium, Turkey and locations across the United States. After his 1971 retirement from being an electrician technician in the Air Force, Buddy worked as a long distance truck driver for Mayflower Moving Company. Eventually Agnes also got her commercial driver's license and the pair drove together as a team for MMC. They traveled across the entire country during their time as drivers, visiting family, friends and old Air Force buddies. When asked about the secret to a long, happy marriage, the couple smiled at each other and responded by saying the trick was in the simple things. "Just keep an interest in each other. Be kind and supportive," Agnes said, adding on that respect was crucial. And Buddy's answer didn't steer far from his bride's. "Respect each other, love each other," Buddy said. "I can't recall us ever having a real disagreement, and it was because we respected each other." Buddy said while he knows many married couples "fuss all the time," he and Agnes would just talk through everything and didn't fight. And as hard to believe as that is for two people who've lived together for over half a century, one of their four children confirmed that detail. "I cannot come up with a time in my head I ever heard them argue or get upset with each other," their daughter Carla said. "They just always talked to each other and worked it out." Their only daughter also commented that her parents have always been in love and they've always been kindhearted and patient with one another. Through their perseverance and commitment, they made an example for the rest of the family to work through problems within their marriages instead of resorting to divorce, Carla said. "I've always felt safe with them," Carla said, tearing up as she watched her parents talk together during the celebration. "They're so sweet, kind and loving. We moved a lot and they were always so supportive." The Fowler's oldest son, Dale, said his parents set a wonderful example of not only a thriving marriage, but how to raise a family. "They were great parents and we couldn't have had a better life," Dale said. "It is very unusual for couples to be married this long, and I've always been proud of them for that." Dale said among all his siblings, aunts and uncles, there have been nothing but long-term marriages. He said his parents led by example and have made a lasting impact on their relatives by their commitment to one another. • The Roland Hayes Tribute Concert this weekend honors local musician who became the highest-paid tenor in the 1920s. Roland Hayes — who was born in Gordon County to former slaves — was, at the height of his career, the highest paid performer in the world during the 1920s. A tribute concert in his honor will be held at the Harris Arts Center tomorrow. 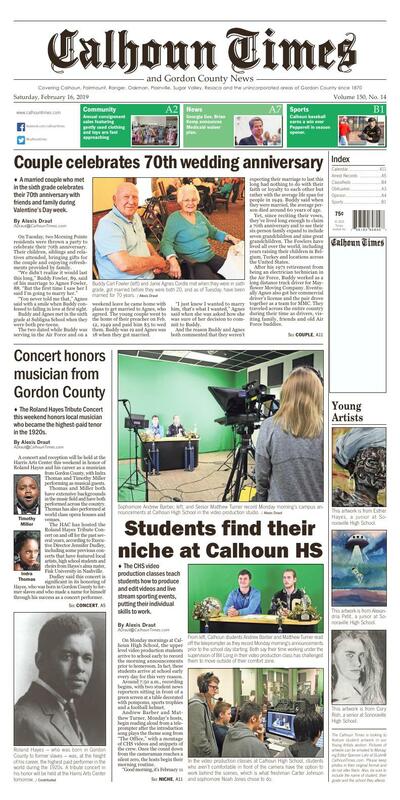 A concert and reception will be held at the Harris Arts Center this weekend in honor of Roland Hayes and his career as a musician from Gordon County, with Indra Thomas and Timothy Miller performing as musical guests. Thomas and Miller both have extensive backgrounds in the music field and have both performed across the country. Thomas has also performed at world class opera houses and venues. The HAC has hosted the Roland Hayes Tribute Concert on and off for the past several years, according to Executive Director Jennifer Dudley, including some previous concerts that have featured local artists, high school students and choirs from Hayes's alma mater, Fisk University in Nashville. Dudley said this concert is significant in its honoring of Hayes, who was born in Gordon County to former slaves and who made a name for himself through his success as a concert performer. According to the New Georgia Encyclopedia, Hayes (1887-1977) was the first black man to win international fame as a performer. He had to drop out of school to help provide for his family, singing in churches and on the street for pennies, said a NGE article featuring Hayes. And despite only having a sixth-grade education, he became a student at Fisk University in Nashville with extra tutoring, mentoring and academic support. The NGE said after working and saving his money, Hayes was able to start paying for the expenses of his first few concerts until he became a well-established performer. As his reputation expanded across the country, he was requested to perform at famous locations like Carnegie Hall, Symphony Hall and other famous concert venues across the United States. In 1920, Hayes expanded his career to reach European countries, performing for King George and Queen Mary of England, and was known to sing in seven different languages. By the late '20s, he was the highest-paid tenor in the world, according to the NGE. His concerts always included African-American spiritual folk songs, and since they were orally passed to him through his ancestors, he arranged the spirituals for orchestral accompaniment to perform at his concerts. In 1924, he performed in Atlanta for a desegregated audience, the NGE said, and later into his career, mentored younger singers and taught at Boston University. Since Hayes' death, many honors, events and awards have been declared in his honor, including an official historic marker in his name in Calhoun across from the Calhoun Civic Auditorium where Hayes had once performed. Also in Calhoun, the Roland Hayes Museum opened their doors in the HAC in 2000, and started holding yearly concerts in honor of the famous musician. "He was such an inspiration and at the height of his career in the mid-1920s, he was the highest-paid (tenor) in the world," Dudley said. "He had a 6th grade education and was told 'no' over and over again. It's such a story of perseverance that is a testament to what you can do if you put your mind to it." Dudley said the HAC wants to honor people such as Hayes who have had such a profound histories and have made an impact on Gordon County. The Music Guild of the HAC, which Dudley said puts on the Hayes tribute concerts, tries to bring several musical genres to the arts center stage and often offers students their first opportunity to perform. This tribute concert is one of the guild's many projects, and the HAC is pleased to be able to bring Thomas and Miller to the concert to honor Hayes. A minister's daughter, Thomas was born and raised in Atlanta, and has sang at the Metropolitan Opera, Vienna State Opera, Carnegie Hall and venues across Europe. She came to fame when she sang in "Driving Miss Daisy" and was Emmy-nominated for her 2003 performance on the New Year's Eve Broadcast Live from Lincoln Center. She is currently on the voice faculty of her alma mater, Shorter University in Rome, and is a graduate of the prestigious Academy of Vocal Arts in Philadelphia. Miller, who will be joining Thomas on the stage, is widely known for his performances of "God Bless America" during seventh-inning stretches at Atlanta Braves home games. He was a soloist for the 2011 Georgia Gubernatorial Inauguration Ceremony and debuted with the Georgia Symphony as tenor soloist in 2016. Following the tribute concert, there will be an opportunity for attendees to meet with Thomas and Miller and visit the Roland Hayes Museum. "They're quite accomplished musicians, and we're just fortunate to get them scheduled for our concert this year," Dudley said. The concert will be held at the HAC, 212 S. Wall St., on Sunday, 3-5 p.m. Tickets ($15 general admission) are limited and the reception following the concert will be a meet-and-greet opportunity for attendees to talk with the performers. • The CHS video production classes teach students how to produce and edit videos and live stream sporting events, putting their individual skills to work. Sophomore Andrew Barber, left, and Senior Matthew Turner record Monday morning's campus announcements at Calhoun High School in the video production studio. From left, Calhoun students Andrew Barber and Matthew Turner read off the teleprompter as they record Monday morning's announcements prior to the school day starting. Both say their time working under the supervision of Bill Long in their video production class has challenged them to move outside of their comfort zone. In the video production classes at Calhoun High School, students who aren't comfortable in front of the camera have the option to work behind the scenes, which is what freshman Carter Johnson and sophomore Noah Jones chose to do. The Calhoun High School video production classes record morning announcements Monday through Friday prior to the school day starting. The studio is equipped with the latest technology and computers to make the recordings go smoothly and allow students to learn more about the production process. On Monday mornings at Calhoun High School, the upper level video production students arrive to school early to record the morning announcements prior to homeroom. In fact, these students arrive at school early every day for this very reason. Around 7:50 a.m., recording begins, with two student news reporters sitting in front of a green screen at a table decorated with pompoms, sports trophies and a football helmet. Andrew Barber and Matthew Turner, Monday's hosts, begin reading aloud from a teleprompter after the introduction song plays the theme song from "The Office," with a montage of CHS videos and snippets of the crew. Once the count down from the cameraman reaches a silent zero, the hosts begin their morning routine. and it's a gold day," Turner, a CHS senior said, introducing himself and his co-host Barber. The hosts talked through the campus' announcements, discussing deadlines for dual enrollment applications, standardized testing dates and sports team updates. And though the two were reading the script, they added bits of humor into their roles. When they talked about the weather, a rainy background popped up on the recording, which Turner said was fitting for that day's weather. Barber announced the high percentage of rain for Monday, which initiated a few off-script comments. "This weekend wasn't bad, I'd say it was mediocre, so we're moving toward terrible," Turner said with a dry sense of humor. The room next to the actual recording studio was where the magic was actually happening. Freshman Carter Johnson and Sophomore Noah Jones were managing the technical production of the recording, uploading it online and sending it to teachers and staff members. There were also students working behind cameras, managing the teleprompter, providing technical support and making sure everything went smoothly. The teacher of the video production class, Bill Long, was present at the recording, but served mainly as a hands-off supervisor: the students were running the production entirely by themselves. "He gives you a list of things you can do and you have to go out and do them," said Johnson, who said he prefers to be behind the camera. "He lets us do our own thing." Following the production, Jones also commented that through this class, he's been able to learn how to work with other students on a team, how to work some of the equipment and how to better communicate with others. "It's hard sometimes, but it's worth it in the end," Jones said. One of their other behind-the-scenes workers, Thomas Pena, said while he doesn't see video production in his future, he enjoys the freedom the class gives him and he likes being able to work audio for the various projects he's involved in. Barber and Turner also had a chance to chime in on why they picked to take this class out other available electives. "For us the biggest part is the social skills," Barber said, motioning toward his co-host. "I feel like if you can talk in front of a camera, you can talk in front of a bunch of people. And it's helped me in other classes." Agreeing, Turner said his interest in production doesn't extend far beyond the class, but he understands how it appeals to others. "The funding for this program shows how much they really care about it and it's important to us here," Turner said. "And being able to talk in front of people is huge." Both of the hosts also said that the CHS program is unlike anything at other schools. They feel fortunate to be attending a school that supports the program and encourages them to reach outside of their comfort zone. "There's not that many high schools that have this opportunity to make such high-quality videos," Barber said. "And we're lucky to have Coach Long, as well. He does a great job with our class." Long, who pointed to the students when questioned about the projects he supervises, teaches the video broadcast production class, but once he sees students know what they're doing, he backs off and lets them do all the work. "It's not for everyone," Long said, "but some people get in here and find a place where they can contribute." Long said he tries to find a place for everyone's different talents, and actually finds that a majority of his students don't want to be in front of the camera. Yet, over time as students grow to be more comfortable with working with the cameras, set and equipment, they are able to find skill sets they didn't know they had, he said. And as two of his main teaching mechanisms, Long said he teaches students through what's already been done in the production field and lets them research and discover how to produce what ideas they have in mind. "Our textbook in this class is YouTube," Long said. "I'm the teacher but I also bring experts into the building from across the planet through YouTube." Long said he has no problem letting students take control of their own learning and pitch him ideas for projects. For his classes, students must participate in a certain number of events, which may or may not include the morning announcements. Other alternatives include live streaming, covering athletic events, filming or helping with lighting for plays, working on backgrounds for announcements and working on longer marketing videos for the school. His students' hard work has also earned the program some recognition on not only a state level, but the national level as well. In 2017, CHS Video won the National Marketing Award from the National Federation of State High School Associations Network, and in 2016, the live streaming production crew was recognized as a finalist for Best Original Programming by the Network. Long said he's also had students nominated for the Southeast Student Emmys for their short film "Joni's Harbin's Journey," some of his students have been nominated for individual production NFHS Network awards and the program as a whole has also been contacted by schools across the country asking for advice and help with their production program. "The only way to get better at being in front of the camera or behind it is to actually do it, and that's what we do in our classroom," Long said. "They can be creative and come up with their own ideas. It's an art." This artwork is from Esther Hayes, a junior at Sonoraville High School. This artwork is from Alexandria Petit, a junior at Sonoraville High School. This artwork is from Cory Rish, a senior at Sonoraville High School.